By STEPHEN C.P. HWA, PH.D.
Modern Tai Chi teaching has been shrouded in ethereal language as if logical thinking and scientific analysis do not apply to Tai Chi. Without a rational framework, Tai Chi practice has degenerated into multitudes of forms with no relevance to the original intent of the practice. Many of them have movements that could cause problems for the practitioner rather than improve their health. 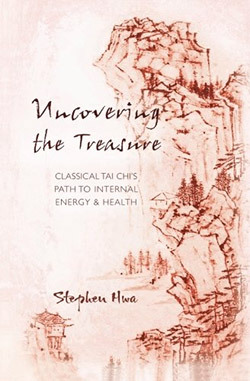 This book is a distillation of the Wu style teaching from Young Wabu (student of Wu Chien Chuan) and thirty five years of discovery through practicing and teaching by Master Stephen Hwa. It offers personal experience and insight into Master Hwa's road of discovery such as, internal energy or internal power, Large Frame Form, Compact Form, Square Form, body posture, Fajin, Qi Gong, Silk Reeling exercise, martial art applications, health benefits. In conjunction with the Classical Tai Chi DVD series, this road and its benefits is open to anyone who sets their mind to travel it. There are so many books, classes, and styles of tai chi today. In many of them, there is talk of internal energy yet the definition is vague and the route to achieving it left unexplained. Join me in uncovering the crucial missing pieces to truly understanding Tai Chi, i.e., the internal energy that powers Tai Chi movements and the learning program to develop such energy. How various components in the Tai Chi teaching program, such as Large Frame and Compact Frame Form, Square and Round Form, silk reeling exercises, etc. fit into the learning program are discussed in detail. It will show that Tai Chi’s ability to mobilize the body’s energy and deliver it efficiently is one of the prime reasons that distinguish it as a martial art. It is the cultivation of this internal energy that produces the most significant health benefits of Tai Chi. The other topic discussed in great detail in this book is the body structure or alignment in Tai Chi Form and its applications. Proper body structure or alignment is essential to the mobilization and delivery of energy and qi flow. It is also essential to maintaining healthy joints in the body for the long haul. Therefore, some of these discussions delve deep into the nitty-gritty of the movements not usually seen in other Tai Chi books which usually emphasize the ethereal aspects of Tai Chi. I sense there is a unspoken belief among modern Tai Chi practitioner that as long as one has the right mental state, almost any movement is a Tai Chi movement. As a result, infinite varieties of Tai Chi Forms sprout everywhere. Those early Masters who developed Classical Tai Chi Form must have had in depth knowledge about body mechanics and its effect on joint health and energy transmission and generation in the body. They meticulously incorporated their knowledge into every move in the Tai Chi Form. After all, a bad posture will stop internal energy generation and qi flow. No mental state or wishful thinking can overcome that. That is the reason why I pay so much attention to the details of the movements in the discussion. Material in this book is based on the teaching from my teacher Young Wabu, who was a student of the legendary master Wu Chien Chuan. From the beginning, I was attracted to Young’s teaching not only for its impact on my body’s well being but also for the logical, rational and scientific approach. Thirty years of studying this art is truly a road of discovery. I am constantly surprised by discoveries of its benefits, its power, and its exquisite structure created by Masters of the past. At first glance, it appears to be very complex, but gradually it becomes simpler because every element in it, no matter how minor it is, follows certain rules and these rules form a logical structure with calculated, scientific reasoning behind it. Every element is optimized toward two objectives; martial art applications and health benefits. As a result, every element is tightly coupled with other elements even though they may appear to be unrelated. The entire structure is rooted in Chinese philosophy. It is truly a world heritage treasure. My attempt to present this treasure to the public first started with the Classical Tai Chi DVD series, and now with this book. Each medium has its advantages and disadvantages. Hopefully, they will complement each other to provide a worthy representation of this treasure. In this book, I present both the overriding principles and certain individual movements. It is from these individual movements that one can see the connections between different elements and how they fit into the overall schemes. Every one of these movements has sufficient descriptions so that the reader might be able to duplicate the move to test its implications themselves. I am very curious on when, by whom, and how this exquisite art was developed. It would be such an interesting and illuminating story. Unfortunately this is not to be. Despite many people’s efforts at searching, the development of this art remains a mystery. To me, the most reliable information is what my teacher told me, ‘that Wu told him that Wu did not change what they learned from the Yang and insisted that they cannot be changed.’ I could see why Wu said that it cannot be changed. With all the interlocking relationships between various elements, any change would result into some collapse of the logical structure. To my thinking, if Wu said that it has not been changed after they learned from Yang, I have to trust that statement. Who will not point out their contribution to the art? It is known that Yang Luchan, the founder of Yang style, learned from the 14th generation of the Chen Family, Chen Chang-hsing. But, research indicates that Chen Chang-hsing learned Tai Chi from an outsider, Jiang Fa, which make sense since the Chen family’s own famous Canon Chuan ( Canon Fist) is based on principles opposite to what taught by Wu’s. Beyond this point the history becomes vague. In the brief record available to us, none gets into the specifics so that one could get a sense of how it was perfected. We can only celebrate what is transmitted from Wu Chien Chuan and the good fortune that the turmoil of war brought Wu to Hong Kong. Wu appreciated Young’s natural ability and his dedication by discarding completely the external martial arts for which Young was known. Wu was willing to stay at Young’s home to teach him. They worked night and day with very little distraction. This is reflected in the rigorous and in-depth material that is passed on. If Young had sought Wu as a teacher at Wu’s home base in Shanghai, he would not have such dedicated attention since Wu was a much sought after teacher with many students there. For this, we should be thankful for what fate brought about.